Crowd-free game viewing is one of the advantages of a private conservancy. These extras are especially advantageous in conservancies that share unfenced borders with Africa’s most famous national parks – South Africa’s Kruger, Botswana’s Moremi and Chobe, Tanzania’s Serengeti and Kenya’s Masai Mara. Depending on the destination, conservancies are also known as private concessions, private reserves, wildlife management concessions and community management areas. Conservancies contribute directly to the sustainable conservation of areas of wild habitat beyond national parks and often improve the lives of rural communities in very practical and meaningful ways. This positive impact means that every guest who stays in a private conservancy enjoys the bonus feel-good factor of knowing that their vacation is contributing directly to protecting Africa's wildlife and untamed places for their grandchildren to explore. Local communities benefit from being part of a wildlife conservancy. Conservancies have fewer lodges than national parks, which means fewer visitors per year, which in turn reduces the impact of tourists on the natural habitat. Tourism provides an ongoing financial incentive plus practical benefits to inspire rural communities to embrace conservation – if everybody benefits from the land being kept wild and free then it becomes safe from human encroachment, over-grazing of livestock, subsistence hunting and poaching. In this way, isolated rural communities become the guardians of the land and animals, choosing to protect both to secure the benefits tourism delivers. Employment opportunities create a positive ripple effect: they motivate parents to let their children finish school and give people the opportunity to improve their living conditions. Direct funding for community projects like building and staffing schools and health clinics, providing clean and reliable water supply, and planting food gardens. 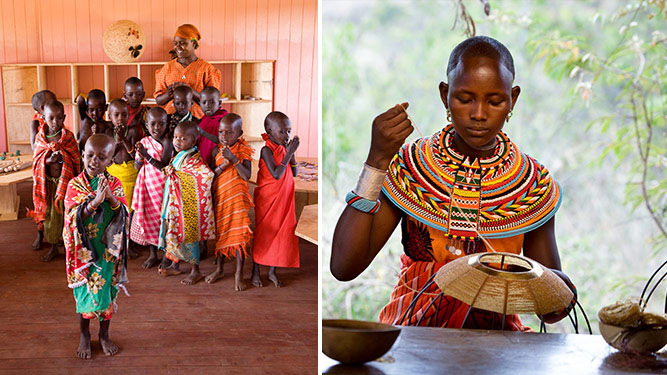 Village visits give tourists the chance to have authentic cultural encounters, which inspire a renewal of pride in the community who may have been persecuted or marginalised for their traditional lifestyle. Inclusion of local communities in a conservancy set-up provides better access to schooling, medical clinics and job opportunities. Since conservancies have fewer visitors at any one time, there are fewer guests on game-viewing activities, even in high season. 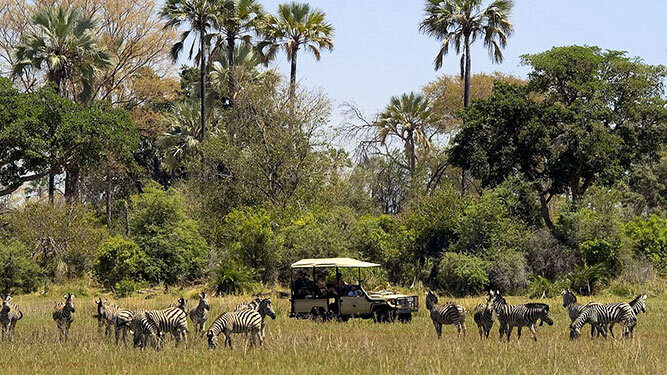 This means largely crowd-free game drives and the pleasure of enjoying a wilderness without seeing more than one or two other vehicles and no congestion around sightings. While the game viewing in national parks is legendary, the high season crowds do take away from the experience. Guided nature walks allow you to experience the wilderness up close, in all its glorious details: animal tracks, burrows, wild flowers, insects and medicinal plants. You’ll see much more walking quietly through the bush than you can imagine – slip past grazing antelope, see more birds and feel part of nature rather than a mere observer of it. 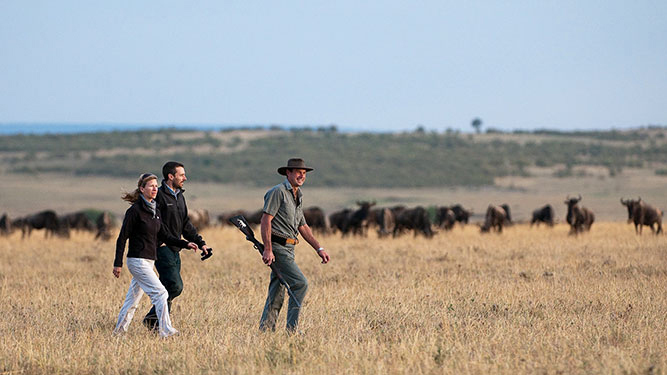 Guided nature walks are a great alternative activity to game drives and don't require more than basic level of fitness. Explore the reserve or conservancy on a guided nature walk. Game drives off road and after sunset mean that your guide can leave the dirt road to get you a little closer to a sighting and show you the nocturnal world of the wilderness using a powerful spotlight. Most predators and especially Africa’s cats – lion, leopard, caracal and serval – hunt at night. They become active in the early evening, which is the time you need to be back at your lodge in a national park. In a private conservancy, you can witness lions getting ready to hunt and even follow them as they scout prey. Typically, the late afternoon game drive ends at a scenic spot for sundowners. From there, the guide uses a spotlight to conduct a night drive back to the lodge. The spotlight reflects the eyes of nocturnal species like civets, genets and aardvarks making them easier to see. Picnic meals are not exclusive to private conservancies but are rarer in national parks. They usually involve a small staff of cook and waiters setting up tables and chairs in a scenic spot with a great view, and preparing a hot meal for you that is every bit as good as what you’d have at the lodge but in a unique setting. Picnics are very popular for brunch, sunset cocktails and dinner eaten alfresco under Africa’s magnificent starry skies. 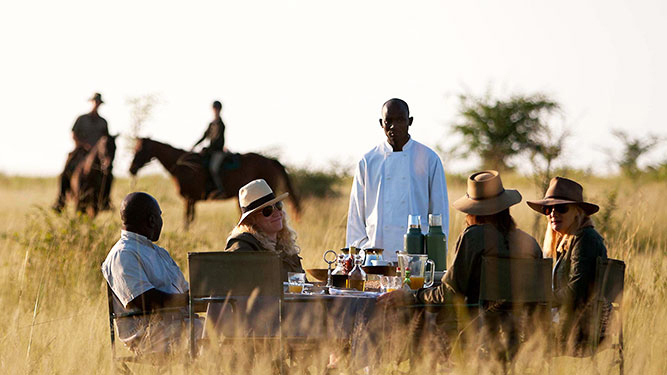 A bush breakfast or picnic is one of the highlights on an East Africa safari. 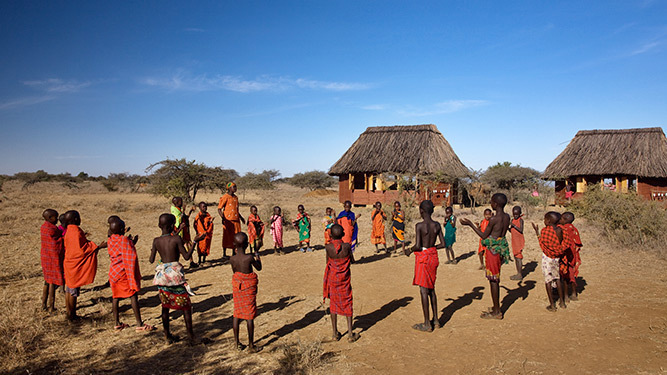 Cultural encounters with rural communities offer you an authentic experience of traditional African culture, like the Maasai and Samburu in Kenya or the Himba in Namibia, as well as the opportunity to see where your guides, trackers, cook, waiters and other lodge staff may have grown up. Your vacation delivers are numerous practical benefits to communities but the emotional value is incalculable, both in terms of the renewal of cultural pride and the demonstration of a direct link between tourists and the benefits of tourism, which is necessary for long term sustainable conservation. Want the best of both? You can have the best of both conservancies and national parks by including a conservancy that shares a fence-less boundary with a top national park in your safari plans.